Dean Murdoch wrote: Do you know any specifics about next year's schedule besides the tournament? Sorry, I do not, although I'm confident Sac State will also be an opponent next season. Scott Leykam merely mentioned that next season's schedule will be "slightly better." I'm guessing the schedule is not entirely locked-in, and surely the non-D1 opponents are not in stone, so maybe there's still a chance UP can avoid those games that no one really likes. I have to say, scheduling is hard! The Pilots can go on the road and make decent "pay to play" money like Long Beach State and others do, but bringing high quality opponents to the Chiles Center is difficult because few teams want to play a Q3 opponent. One of the best ways to get a quality opponent to come to Portland is to contact a team that has a Portland area player who'd like to play in front of his hometown crowd...it has been done more than once in recent years. DoubleDipper wrote: IMO, the Pilots need coaches who can DEVELOP the talent they've recruited. Whether a coach leaves or the coaching responsibilities change, it will be all about player development going forward. ….if there is to be a change, it's going to have to be toward finding a coach who may not be a renowned recruiter, but one who can develop recruits. And they sure didn't waste much time clearing him off the Pilots website! Well, he hasn't updated his twitter bio yet. I will miss his frank assessments. It is hard to imagine finding a more experienced assistant coach willing to come to UP. I assume the timing is tied to the Final Four, which I believe is also a coaches' convention. Lots of job seekers and hiring coaches there. Our Hoop Scoop ratings will go all to hell now. But good luck to you Coach Cantu in your endeavors. I will miss his frank assessments. It will be interesting to hear his first interview where he is asked about his time in Portland. What is that podcast he frequently guests? The fact that he is leaving without having a place to go speaks volumes. bullwinkle wrote: The fact that he is leaving without having a place to go speaks volumes. The volume about Cantu,or the one that’s indexed for UP? Well, there’s the way or the highway. Interesting comment on the state of Pilots athletics?? During the 24 hours of PilotsGive, that ended 2 hours ago, women's and men's soccer had the highest number of donors (251 & 239), baseball ($14,553) was second only to women's soccer ($15,519) in terms of money raised, and women's basketball had 53 total donors compared to just 9 for men's basketball. Do you suppose if there were a men's basketball fund to payoff TP's contract, the numbers would have been a lot higher? 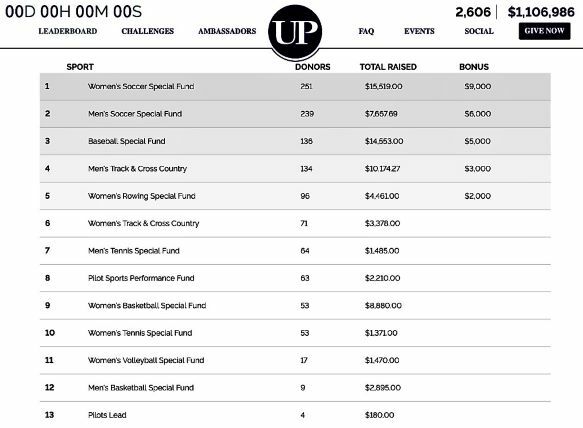 UP's goal of 2,019 total donors and $1 million raised was exceeded....congratulations to all who participated! UPDATE: There must have been some "after hours" trading because the numbers shown on the website linked above now show the baseball fund to be the richest at $15,638 and women's soccer second with $15,609....standby for more updates? StudentPilot wrote: Interesting comment on the state of Pilots athletics?? My take on peer-to-peer fundraising efforts like this is that typically you only get as much out of them as you're willing to put time in beforehand spreading the word and getting people to commit to give on that day. I follow most (if not all) UP sports teams on social media, and most of them had been promoting this event quite a bit... which I assume also means they were sending out emails to alumni/parents/friends/family members. I didn't see men's basketball doing a lot of that, so I'm guessing that's likely the reason for the lower numbers. And to be clear, I don't mean that as shade on the men's basketball staff... they've got enough on their hands right now with staff changes and filling spots created by player departures that I'm not surprised hustling people to give to this campaign fell near the bottom of the priority list. I suspect many basketball fans may have had the same attitude I did - I could not in good conscience donate in the name of men's basketball because it could be misinterpreted as being supportive of continuing the current leadership. I really hope Terry proves me to be a liar, cheat, and a scoundrel, but as long as he's here, I expect we'll continue to be 10th in the conference. I cannot support that. Stonehouse wrote: And to be clear, I don't mean that as shade on the men's basketball staff... they've got enough on their hands right now with staff changes and filling spots created by player departures that I'm not surprised hustling people to give to this campaign fell near the bottom of the priority list. The women's team lost their head coach and top assistant in mid-March, but still seemed get support during the funding campaign....the men lost an assistant one day before PilotGive. Regardless, just a year ago, when I was still at UP, my roommate worked in the MBB office, and together with public relations and digital media staff, kept the social media aspect alive with next to zero coaching staff input. MBB is by far the most funded athletic program on campus, and year-to-year has the most generous patrons, but from my perspective these peer-to-peer fund raising events require player involvement, and most all the teams besides MBB have a real closeness and spirit about them that generates enthusiasm from others...I don't see that from MBB, and I know most of the guys pretty well. Another good article from Kerry Eggers: "PSU, UP men's basketball going in different directions?" Porter has had a problem with players transferring from his program. Guard Jazz Johnson, the No. 2 scorer off his first UP team in 2016-17, transferred to Nevada and averaged 11.0 points off the Wolfpack bench as a junior this season. Center Joseph Smoyer, who played his first two seasons under Porter at UP, is now at Columbia. The exodus continues this season. Shooting guard Marcus Shaver, the Pilots' leading scorer at 14.8 points per game as a sophomore this season, has put his name in the NCAA transfer portal. "It was a surprise to me," Porter says. "It's unfortunate. I can't fight it. When you're trying to build a program, and invest in a young man, you don't ever want them to leave. The big movement in college basketball these days, though, is for students to want to go to a bigger stage and fulfill their dreams." Terry has my support," (Scott) Leykam says. "We've had some good discussions the last few days. This year — the conference season, in particular — was hard on everybody. The second the season was over, we're refocused. We've talked about what a team identity looks for us — offensively, defensively, who we are from a player development perspective, what we need from a recruiting perspective." The Pilots probably couldn't afford to fire Porter, but Leykam says that wouldn't be his intent, anyway. "After a season like this, you look at everything," he says. "I don't think it's fair to put it all on the head coach. This is a tough job. it's a place where basketball success has been fleeting over the years, but we can't use that as a crutch. "Men's basketball is critical from a revenue and visibility standpoint. There has to be a commitment from me. I have to make sure we're supporting them, that we are putting the infrastructure in place for them to succeed. ... But we have to start moving the needle in basketball. Basketball success affects everybody." Bob Cantu wrote: I wanted to clear up my status as an Asst Coach at Portland. I’m out in Minneapolis for the Final Four festivities but want my friends and colleagues to know the truth. I was let go from Portland on Tues morning and I am a free agent to any school. I thank Portland for 3 years of experience, but I am really excited for the future. I am following up on many leads of open positions and hope that one will lead to a great situation. Coaching is difficult and after 23 years of it nothing surprises me. I stand by my experience and resume. I am proud of what I have been fortunate to be a part of. My family is excited for the next chapter of my book of this coaching journey.... Thank you to all my friends and family for the support. We will be just fine and be in a better situation sooner than later. It seems like we have a similar interview after almost every season, and here we still are, decades later... Its hard to keep believing that *this* time it will be different. Just wait for the feel-good article about how he is helping the players off the court, making sure they're prepared for job interviews after graduation and that they know how to tie a tie, etc. Then you'll know he's got about two years left. I wanted to clear up my status as an Asst Coach at Portland. I’m out in Minneapolis for the Final Four festivities but want my friends and colleagues to know the truth. I was let go from Portland on Tues morning and I am a free agent to any school. I thank Portland for 3 years of experience but I am really excited for the future. I am following up on many leads of open positions and hope that one will lead to a great situation. My family is excited for the next chapter of my book of this coaching journey.... Thank you to all my friends and family for the support. We will be just fine and be in a better situation sooner then later. Apparently to be a fired as an assistant coach from the basketball program at Portland is akin to being orphaned. No announcement of the departure whatsoever. No recognition that you were there. Your efforts arguably unappreciated. While it has been suggested that a coach with greater abilities in developing players would be preferable, it's not even clear that Cantu will be replaced. His termination may be for the same reason that Porter was retained: saves money. Do we know if a "national" search is underway? wrv wrote: Apparently to be a fired as an assistant coach from the basketball program at Portland is akin to being orphaned. No announcement of the departure whatsoever. No recognition that you were there. Your efforts arguably unappreciated. Under ordinary circumstances such as this, is it standard practice to announce the termination of assistant coaches? Is standard practice the only consideration at an Institution which maintains it is a place of values. Some small note after 3 years would have been appropriate regardless of what standard practice at other less given to values institutions may follow. wrv wrote: While it has been suggested that a coach with greater abilities in developing players would be preferable, it's not even clear that Cantu will be replaced. His termination may be for the same reason that Porter was retained: saves money. Do we know if a "national" search is underway? up7587 wrote: What is that podcast he frequently guests? - I think Cantu was dismissed because he was as candid with Terry, and perhaps Leykam, as he was with fans (which we loved about him). - Between Cantu, Johnson, and Geving, there is over 60 years of college basketball coaching experience. - I don't think Terry listened to any of them, and certainly didn't seek, nor listen to the important things they could have offered. In spite of a trail of failure, our offense didn't change throughout the year. I may be wrong, but in three years, I don't recall once seeing an assistant take over a time-out for part or all of the break. You see it regularly with other teams (In fact, Frankie Ferrari of USF took over more than one time out for the Dons while Kyle Smith observed). - While there is argument about the quality of our players, I'm one who believes we have players who belong at the D1 level and are equal to most of the other WCC teams. They desperately want to win and are doing the best they can to execute what Terry wants. It's not working. If my premise is right, that means the problem is either the teaching is substandard or they're learning the wrong strategies. - If we'd have had a 20 win season, I suspect Franklin would be doing his post graduate work at UP, and none of our guys would be on the transfer list. - All this talk about what we need is better international recruitment, leadership from a grad transfer or JUCO transfer, and better player development is all true, but it doesn't address our core problem. It's just putting more lipstick on this pig. Hopefully we'll see marginal improvement, but what we need is new leadership. - In spite of Leykam's affirmations of support, I think we're stuck with Terry because Leykam either neglected or was unable to negotiate a contract provision that would allow for dismissal due to abysmal performance. - Maybe all of the end-of-season talks and the dismissal of Cantu will change things, but change is hard for people, and when stress is up, change is nearly impossible. Porter is in a catch-22 - needs to change in order to be successful - but too stressed-out to be willing to change. - If Terry was a stand-up guy, he'd stand up and walk away for the good of the program and university. He could show the grace and dignity we all attribute to him.